The video is disturbing, and underscores the need for federal officials in OSHA to take steps to protect healthcare workers from violence. 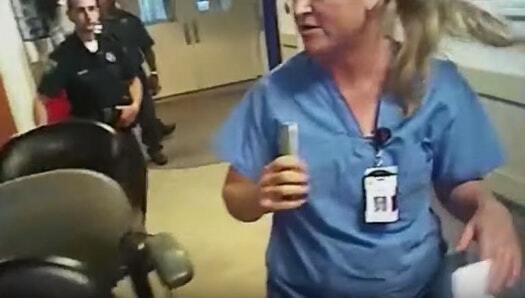 In it, Utah nurse Alex Wubbels calmly tells a detective that she cannot draw blood from an unconscious patient without a warrant, an arrest, or some form of consent (e.g. from the patient or a medical power of attorney). A hospital administrator can be heard on her speakerphone, backing up nurse Wubbels and asking the detective to not get angry at the messenger. The detective snaps, pushes nurse Wubbels outside, and arrests her as she screams for help. Indeed, touching a patient, performing a procedure, or drawing blood from a patient without their consent is assault and battery and is contrary to a patient’s right to privacy. Wubbels followed her hospital policy, her obligations under her nurse practice act to advocate for her patient, and her ethical duty under provision 3.1 of the Code of Ethics for Nurses to protect the privacy and confidentiality of her patient. She did so calmly and professionally, and with the backing of her administration. And she was arrested for it. So what’s the lesson to be learned here? For one, that Alex Wubbels is a hero to her patient, to her hospital and to nurses across the country. Two, even when nurses do everything right, we oftentimes still face repercussions. Rightfully refusing an unsafe assignment sometimes leads to discipline. Rightfully speaking out about unsafe patient care conditions sometimes leads to termination. And, taken to an extreme, doing everything exactly right in advocating for the rights of your patient apparently sometimes leads to arrest. But, make no mistake about it: nurses will do what’s right in the interests of advocating for our patients, regardless of the situation. The upshot here? Nurses are closing their ranks around Alex Wubbels. Across the country, we are speaking up online, in the media, and as professional organizations to decry what happened to nurse Wubbels and to call for accountability and changes to ensure this never happens again. We hope the public and the federal government will join us.